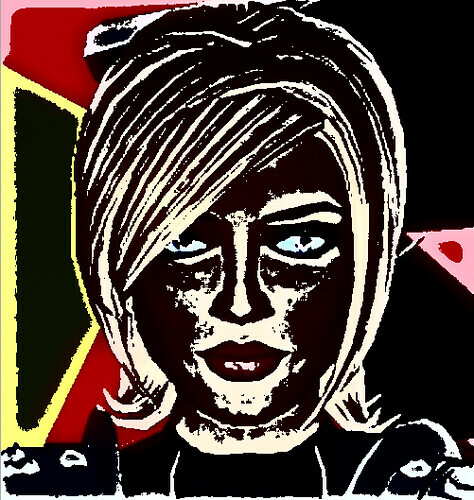 Botgirl's Digital Playground: Avatar self-portraiture on Flickr: Art or Onanisim? Avatar self-portraiture on Flickr: Art or Onanisim? The shiny new parent/lover/toy syndrome: I have a pair of childless human friends who got married and bought a small dog. I must have received links to a hundred or more images for the first couple of month: Dog on the couch. Dog in the yard. Dog in the boat. Dog with the cute hat. I haven't seen any research, but my guess is there is some logarithmic curve downward for how many photos are produced for subsequent pets, children avatars, etc. Neo-Narcissism: This applies to Immersionists, both open and closeted. It seems to me that if one identifies personally with the avatar form, then having a gazillion photos of oneself on display on flickr is equivalent to a human doing the same thing. Obsession with one's physical form isn't always ickishly shallow. Not always. And self-love can be a beautiful thing. Or self-lust. Avatar as canvass: For those with a bona fide artistic nature, or wannabe's like me, we will never find a more patient model than our own avatars. They will pose for hours without complaining. They never ask for a royalty check. Although they may not be easy to work with, it's certainly a familiar and comfortable relationship. And you always get to sleep with the hot model, right? Although this is a somewhat tongue-in-cheek post, my guess is that there are multiple elements at work in many of our photographic exploits. Did I miss any categories, whether serious, semi-serious, farcical or otherwise? I have noticed self-portraits intended to send a clear message to a specific person. I have seen photos that say "See I am having fun without you. I don't miss you at all." Sometimes you need to know the back story in order to understand the message. But, oh yes. People post photographs to Flicker as a way to communicate. I think they may just be self obsessed/vain/narcissistic like many of the humans on Flickr. Assuming most people's avatars are better looking than them, maybe camera shy persons are able to enjoy vanity for the first time and get carried away? Personally I like to take shots of interesting avs or outfits. There does seem to be a disproportionate amount of self portraits, just going from the content of some of the general-purpose SL groups. Do we get extra points for hitting all 3 marks simultaneously? chestnut: Wow. I didn't even consider that scenario. Thanks! chaddington: chestnut's comment reminded me that unless you know the particular shooter, it's impossible to really know the significance of particular photos. I think it is possible to make some generalized suppositions and certainly to evaluate one's own motivations. truthseeker: That's what I need! I should assign Botgirl karma points for commenting, etc. It seems to be working for Plurk. So yes, I owe you some points.